How do they survive the cold? Boreal Chickadees live in the boreal forest year-round. How do they survive the harsh winter? First, during summer, they cache a great deal of food, both insects and seeds. Then in fall, they put on fresh, heavier plumage. And their feathers are denser than most birds', creating a comfy down parka. Most impressive? The chickadees lower their body temperature at night from 108 degrees to just 85 degrees, conserving their stores of insulating fat. 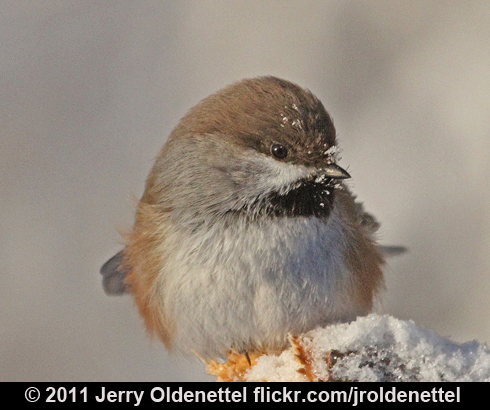 Hats off to the Boreal Chickadee, a truly rugged bird! Learn more at the links below. This tiny, dark-capped fluff-ball lives here year-round. How do Boreal Chickadees survive the harsh winter? Then in fall, the birds put on fresh, heavier plumage. And their feathers are more dense than most birds’, creating a comfy down parka for the chickadee. And most impressive, the chickadees adapt to deep cold by lowering their body temperature at night from 108 degrees to just 85 degrees. In this way, the birds conserve their stores of insulating fat. Sounds of the birds provided by The Macaulay Library of Natural Sounds at the Cornell Lab of Ornithology, Ithaca, New York. Boreal Chickadee (unedited) recorded by Gerrit Vyn; Boreal Chickadee 77205 by C.A.Marantz; wail of the Common Loon 107963 by S.R. Pantle.